Taxpayers in Massachusetts moved a major step closer to having a Sales Tax Holiday again. 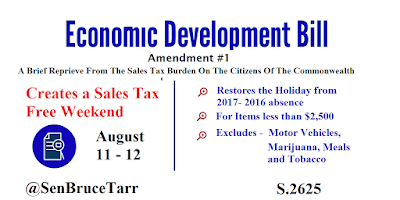 My amendment, #1 to the Economic Development bill, gives consumers & retailers an August 11 -12 sales tax free weekend on items less than $2,500. I thank my colleagues for their support - the vote was 31 in favor and 6 opposed. The members of the Massachusetts Senate GOP Caucus and I have pushed for years to institute a permanent sales tax free weekend. We started debating the bill earlier in the day and have several dozen amendments still to debate.